As I was exploring the edge of the Potomac River yesterday at Riverbend Park, I flushed a fairly large dragonfly. Rather than fly away, it perched in a nearby tree, just above eye level. I suspected that I had interrupted a meal and that it wanted to enjoy its prey in peace. The dragonfly was in the shade and the light was filtering in from in front of me, so the shadows made it hard to tell exactly what was going on. I fired away anyways, hoping that I would be able to salvage the images afterwards. 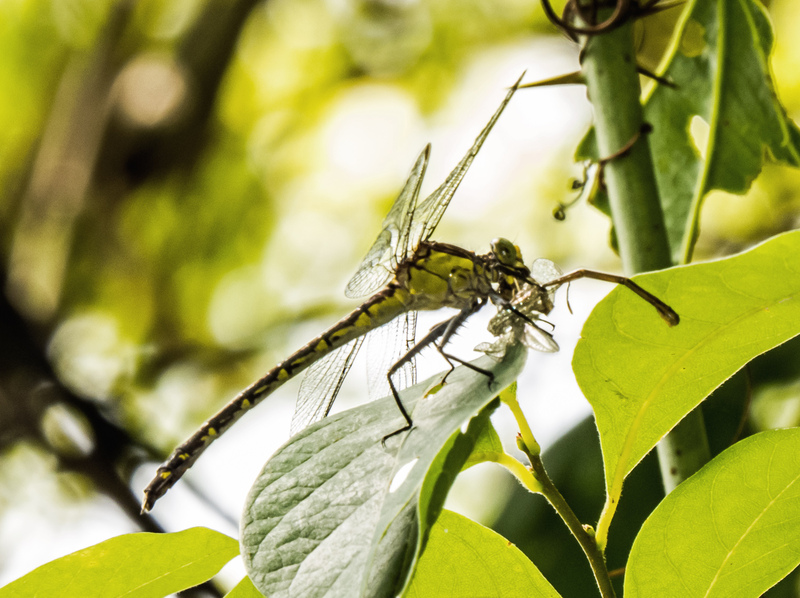 It turns out that the dragonfly is a Black-shouldered Spinyleg (Dromogomphus spinosus). 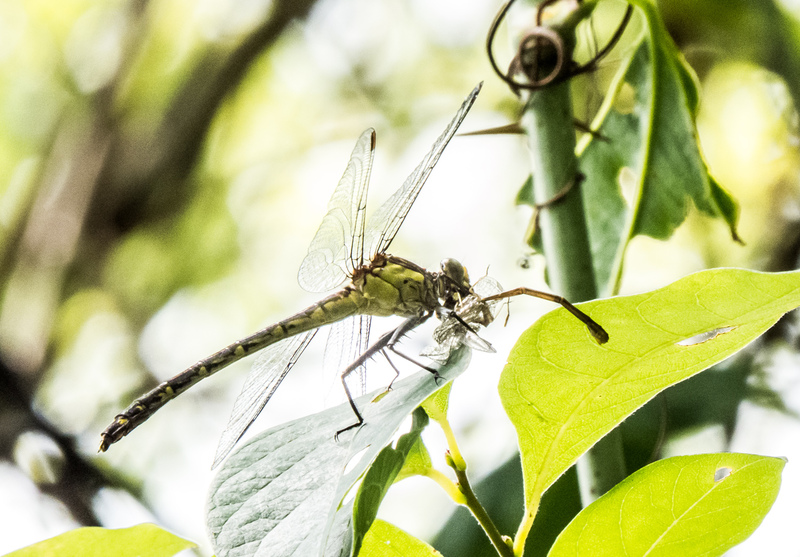 You definitely can see the large spines on the dragonfly’s back legs, which help in capturing and holding prey, and you can sort of see the black shoulders. As I suspected, there was a prey–the dragonfly had captured some kind of damselfly. I decided to try a couple of different techniques to try to capture a usable image. In the first shot, I used software to adjust the exposure levels and remove some of the shadows, which had the side effect of brightening the entire image and blowing out some of the detail in the background. As a result, the leaves also look a little washed out. In the second shot, I used my camera’s pop-up flash to help eliminate some of the shadows. The resulting image retains a bit more of the full range of tonal values, but may still be a little too dark. Neither image is perfect, but wildlife photography is so often about making compromises. Benjamin is spending the weekend and is seeing your post right away. He is fascinated while hearing the edited post, examining the enlarged photos and analyzing all the details of the dragonfly. He calls it a “raptor dragonfly” because it is “eating the smaller one”. Benjamin is quite philosophical about this, saying : “Everyone has to eat, even dragonflies!” He also says : “Mr. Mike takes awesome pictures!” Thank-you!! I think the second image is probably more pleasing to the eye, perhaps because of the wider range of greens it captures. Nice shots, Mike. Just as a suggestion, if you adjust the highlights down, rather than the shadows, it will tone down the shots without losing detail. Maybe try that to see what it looks like. Thanks for the suggestion, Chris. I will try adjusting the highlights more to see what happens. Nice Mike! Never saw one of these before. What software do you use to adjust your files? Do you shoot raw files or jpegs? I shoot RAW almost all of the time. At the moment I am using Photoshop Elements and do most of my adjustments in Camera Raw.